Numbers. In this day and age they are everywhere. Whether it’s the number on the scale, how many “likes’ or “follows” we have, the pairs of shoes we own, or the amount of gray strands on our head, numbers impact our life in a big way. But our worth is only determined by one number: One. 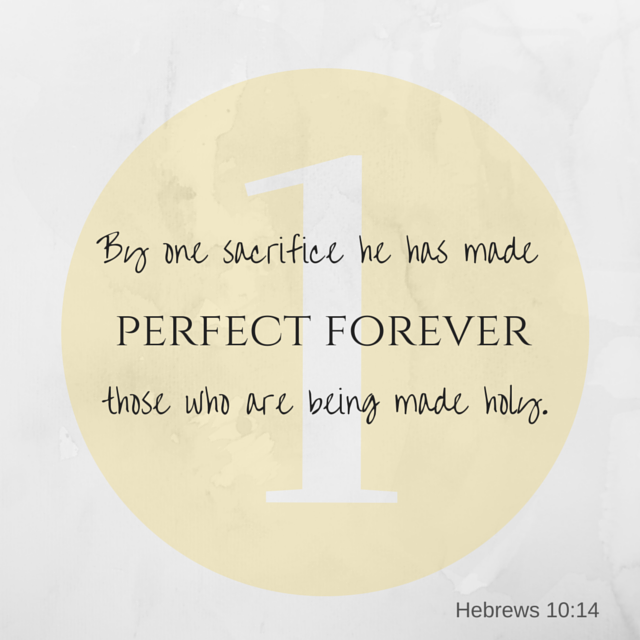 One sacrifice by the one God who loved us enough to send his one and only son, Jesus, to die for our sins so that we would be made perfect in and through him. Oh, friend, did you hear that? Perfect? We’ve spent several weeks now walking around that word. Perfect looks. Perfect body. Perfect job. Perfect family. Perfect social media following. Go ahead and add your own, but in short what we’re looking for is our worth through the perfect life. We strive for a perfection the world will notice yet in one single moment Jesus Christ delivered ultimate perfection to us. It’s not anything we deserve or anything we can obtain outside of him—nor is it anything we will see while our feet are still on this earth. Yet God sees it the moment we accept Christ into our lives as Lord and Savior. After that one decision, every lens God views us through shows us nothing short of perfectly beautiful in his sight. And God is the only one who matters. He is the one who created us. The one who gives us beauty from ashes. The one who redeems our past and makes a way for our future. The one who wove into us our purpose. The one who overflows us with immeasurable worth. The only one you need. Jesus. Lord, today help us to forget all the numbers invading our life. Rather let us only see the impact you have on our life. Let us not weigh or measure our worth by anything other than you. Who you created us to be. How you redeemed us. How you value us. Transform the way we see numbers, Lord, until the only thing we see is you. Today before you log onto social media, step on a scale, or look in the mirror, hold up your pointer finger. Look at it. Not only does it represent the number one, but it’s pointing up to the only One who matters. Every time you’re tempted to believe the other numbers in front of you, hold that finger up and believe the One it’s pointing to.